Love this cruise to Cabo. I have been several times but this is the 1st time I took a princess excursion. Two actually. They were a great value and lot of fun. Went to hotel California And whale watching. Because I went by myself I did things by myself That the group didnt wanna do. Like staying at EFFE&apos;s jewelry For the big drawing of the diamond earrings. I stayed and I won the diamond earrings. Yahoo!!! I want the 1st day and had my hair done and it had several other appointments made for different spa treatments. Probably bought more products and I should have but I like them and I&apos;m having fun with them. Met Dimitris Vrahnoss In the Fitness Room. What an asset to the princess Cruise lines. What a great spirit very knowledgeable of his background And the programs that he taught. Plus what a great smile. 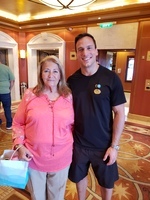 Myself and Dimitris, Princess fitnes trainer. 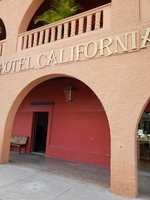 Hotel California, Dos Santos. Great tour! Great food and drink! 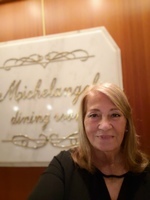 In front of Micalangelos dining room. Wonderful food and new friends!